Stimulus Package consists of 12 9" plastic shad loaded with 1/4 oz. 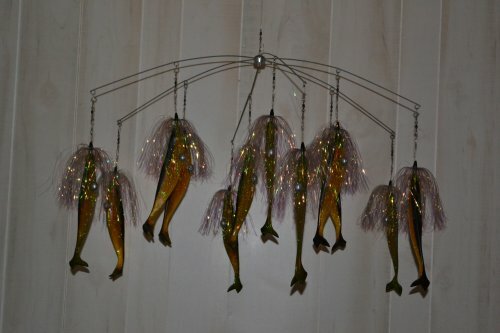 bling skirts made of soft mylars for incredible flash rigged on a 32" stainless steel 6 arm dredge bar to simulate a school of fish. Each shad is keel weighted with an egg sinker to further enhance their lifelike action. Dredge weight is recommended. Storage bag included. Contact us for custom colors! Extra drops available.